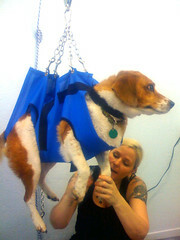 Holly took Rufus and Apple to the Dirty Dog Pet Wash and Boutique to get a bath and have their nails done. Rufus HATES getting his nails trimmed and is such an absolute freak about it that I try to take him to a different groomer every time. The owner of the Dirty Dog apparently specializes in high maintenance hounds and had a very effective trick up her sleeve: the floating harness! Rufus dog-paddled in mid-air and chuffed while the trimming was going on, but seemed rather calm when he was allowed to just float unmolested. Holly theorizes that the compression of the harness has a calming effect, but I prefer to think that he was overcome with dreams of ear-powered flight. I can't wait for his next visit.